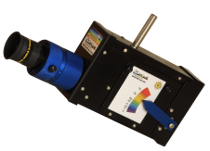 Lhires Lite is your ideal public outreach spectroscope. Simple to use, robust and safe: Lhires Lite will add a colored touch to your public outreach! Lhires Lite is provided in a custom-foamed carrying case with an eyepiece of 31.75 mm, a user guide and some verniers scales set. 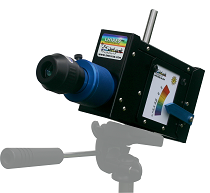 The Lhires Lite spectroscope is based on our own experience in scientifical animation. It has been specifically designed to be easy to use, robust, and without danger. It attaches directly on a photographic tripod (Kodak standard). Lhires Lite is specially well adapted for the public. Show them the solar spectrum at his best: thousands lines are visible! Lhires Lite slit is a center piece for the quality of the spectrum obtained with the spectroscope. Everyone’s eyes are not the same. 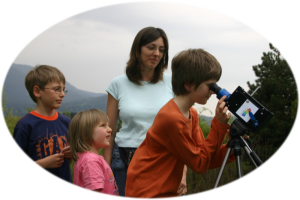 This is why we are including an adjustable eyepiece with the Lhires Lite spectroscope. It is easy to use and well adapted for children. Like a solar clock, point the Lhires Lite toward the Sun so the shadow of the stick disapear. 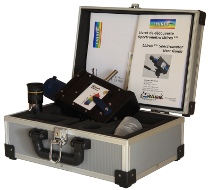 The Lhires Lite spectroscope does include several scale you can use to help identifying the lines either in the solar spectrum or spectral lamp. You can also create your own or use a blank paper for the students to draw the spectrum they see and compare with reference scales. Each Lhires Lite is delivered in its own handling case, making it easy and practical during external public outreach activites. Educational page done by Olivier Garde. Download and print it (in color!) to distribute during your public outreach activites. Some absorption lines are noted; zoom around Sodium doublet and Magnesium triplet will help you too. User manual: PDF file of the manual shipped with every Lhires Lite. 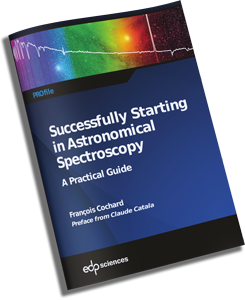 This leaflet provides some ideas of projects to conduct with your Lhires Lite spectroscope.